Notes: The South of Ireland Open Amateur Championship is held at Lahinch every year since 1895. 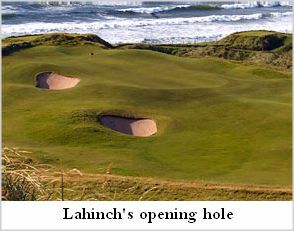 Golfers will often tell you Lahinch was their favorite stop in Ireland, without being able to pin down the exact reason. Its location next to a charming village in this wide open, still-rural part of County Clare (from the 18th green, you can walk to the nearest pub in less than three minutes), a design pedigree that traces straight back to St. Andrews, and a famous family of goats that patrol the course add up to create a mystique that lingers in the memory. The old course here presents just the sort of struggle with the elements you’d expect on a classic seafront links. The steady wind off the Atlantic lets you know quickly that you’d best hit the ball solid and low. Adding to the challenge are the half dozen or so blind shots the course dictates. A caddie is an absolute must on a course like this, both for advice and to lug your bags up and down the undulating hills. The landscape is so hilly here you can almost get lost at points. Lahinch lies between the River Cullenagh, Liscannor Bay (a very minimally protected piece of the Atlantic Ocean) and Lahinch town. It has a varied personality that draws from the seven different course designers who’ve laid their hands on it over the past century. The most legendary of these is Old Tom Morris, who arrived at Lahinch from Scotland in 1894. Morris was a genuine founding father of the game, who started out making golf balls, then clubs, then became green keeper at The Royal and Ancient of St. Andrews. He eventually turned professional player, helped set up the original Open Championship and proceeded to win it himself four times (his son, Tom Morris Jr., also won it four times). What Morris found when he got to Lahinch was a rough course laid out by officials of the Limerick Golf Club with help from some Scottish military officers. From the many enhancements he added, several remain untouched. The most famous is the par three 5th, a hole known as “The Dell." The green is completely hidden from the tee by sand hills covered with fescue. It takes an act of faith to simply aim for the white rock they’ve placed atop one of these hills and pull the trigger, hoping to carry the 154 yards to a smallish green (the stone is moved whenever the pin placement changes). “Unorthodox" is the term used to describe this hole, which continues to both charm and unnerve golfers to this day. According to Lahinch’s Secretary Manager Alan Reardon, “several golf architects have looked at the Tom Morris holes over the years, and said “don’t change them.’ We’ve had golfers from Tom Watson to Mark O’Meara say exactly the same thing. Of course, no one would design them this way today. Aiming at a stone was alright back then." Mr. Reardon says the famous fifth isn’t too tough, “if you play it as a par 5." The old course received a drastic redesign in 1927 by Dr. Alister MacKenzie (who one year later designed Augusta National at the request of Bobby Jones). MacKenzie’s creation remained intact for just 10 years, however, before a long series of alterations began which ultimately left it a bit too eccentric in the eyes of some. In 1999, designer Martin Hawtree was called in to give Lahinch a major facelift, with an eye toward returning it to Mackenzie’s original vision. Two key results of this, Mr. Reardon says, are the toughening of several second shots and undulating greens more like Augusta’s. Fairways aren’t particularly narrow, but players who are wild off the tee will lose lots of balls, particularly in summer when the rough is high. Lahinch no longer allows you to leave any of your game in your bag. A key result of Mr. Hawtree’s upgrade is that second shots are more consistently demanding, and the greens have the same undulating slopes as other Mackenzie courses. A real gut-check hole on is the 4th, a par 5 known as “The Klondyke," another of Tom Morris’s holes. While it’s short for a par 5 (472 yards from the blue tees) it’s absolutely imperative to carry (or get around) a monster dune by your second shot. You then face a downhill approach shot to a green that’s set hard-by a boundary wall and a road. If you succeed in hitting the green, you’re now on the trickiest part of the hole. Your round will then take you through a sixth hole playing more than four hundred yards straight into the wind, an 8th hole that’s outrageously scenic and a bit easier to play, and a 12th hole considered by many to be the toughest on the course. This 577 yard par 5 requires a tee shot to the left center of the fairway, straight toward the castle ruins in the distance. A bit too far left, however, and you’ll lose your ball in the tall grass and be forced to reload. If you’re feeling a bit jet lagged (Lahinch is often the first course played by American visitors because of its proximity to Shannon Airport) 15, 16 and 17 may be rough. The par 5 18th can be reached in two by mere mortals, and with a good putt you can get back into Lahinch’s clubhouse in a glowing mood.